The ODROID-C2 is a 64-bit quad-core Single Board Computer (SBC) that is one of the most cost-effective 64-bit development boards available in the ARM world. 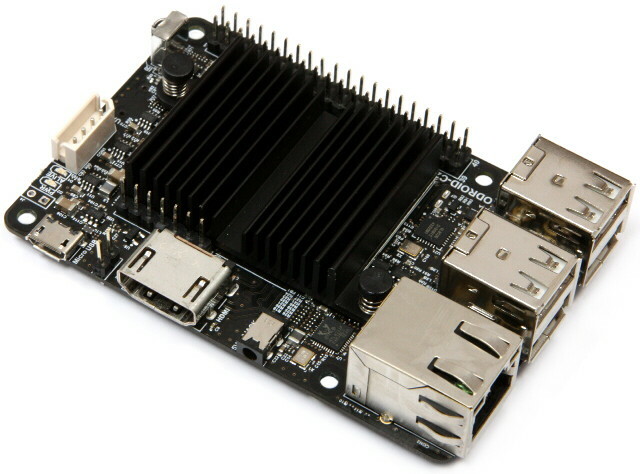 The ODROID-C2 has many advantages over the Raspberry Pi 2. The processor is an S905 ARM 64-bit 1.5 GHz quad core with 2 GByte DDR3 RAM, Gigabit Ethernet and IR receiver. The size of this computer is still only 85 mm x 56 mm with a weight of 40 g, and offers silent operation, 2~5W average power usage, and instant portability, since it fits in a shirt pocket. One powerful feature of the ODROID-C2 is an SD 3.01 standard compatible UHS-1 MicroSD card, as well as the faster eMMC module. Insert the MicroSD card into the slot, connect a monitor, a keyboard, a mouse, Ethernet and power cable, and that's all you need to do to use the ODROID-C2! Browse the web, play games, run office programs, edit photos, develop software, and watch videos right away. The ODROID-C2 also has a 40+7-pin GPIO header to make a physical interface between the board and the outside world. The 40+7-pin interface headers include PWM, I2C, I2S, UART, ADC and GPIO function. The IR receiver and ADC features on the ODROID-C2 offer many options for building great DIY projects. The C2 can boot from a MicroSD card or an eMMC module. The MicroSD interface supports the higher performance UHS-1 mode as well. File access of a 512 MB file (read/write) on two different storage options shows distinct performance differences. The eMMC 5.0 storage is ~7x faster than the MicroSD Class-10 card in read tests. The MicroSD UHS-1 card is ~2x faster than the MicroSD Class-10 card in read tests. The MicroSD UHS-1 card provides a great low-cost option for many applications! The C2 has an on-board Gigabit Ethernet controller. The bi-directional streaming speed was measured at ~900Mbps. Thanks to the doubled Tx buffer in the S905, the upload speed is twice faster than C1.